We have another update for you to improve some of the issues found after the release of Seasons and the June update. Take a look at the notes to see what has changed. Thanks for your support and be sure to enjoy the fantastic summer weather from time to time! Let’s get into the patch notes! We addressed an issue where the game would lag when placing wall patterns on blocks that were touching roofs. The Reset Object cheat is now available to the community again. You could say that we reset it. Sims no longer route fail when trying to enter a room on foundation level 1 that doesn’t have a stair. They just step up like a big kid, now. 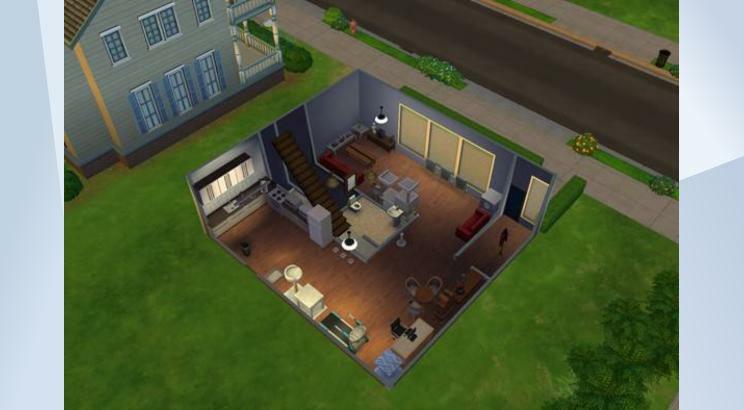 Neat Sims are no longer uncomfortable when near a fire place that has assorted upgrades. The lid for the GrillWise by GrillMania has been returned. The Lice Cold Retail Freezer can now hold harvestables for you to sell. 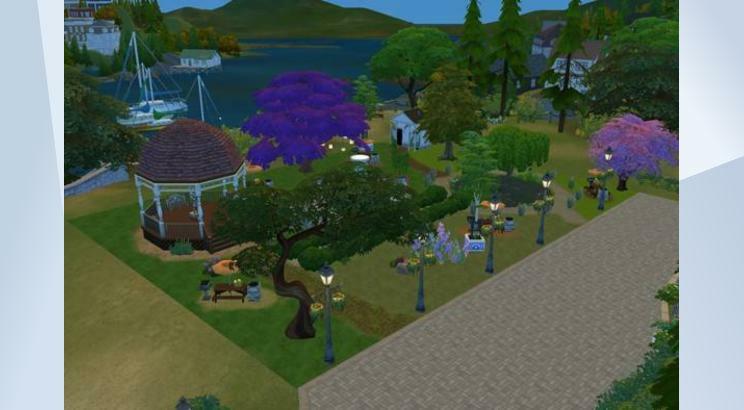 Cats and dogs should no longer fill your Sims’ queue with interactions. We want the pets to be friendly, but perhaps not that friendly. Emotion berries now provide emotions again, which is a berry good thing. Thermostats now have their interactions available when placed on Commercial and Vacation lots. You can no longer use the Woo interaction with Bee Swarms to, *cough* woohoo with a relative. Patchy the Scarecrow will no longer change into a human. We addressed an issue where roof decorations on some lots didn’t look appropriate for the Mac. With the launch of Seasons we encountered a few issues we weren’t expecting and wanted to quickly address as many issues as possible. We’re still following up on several community reports, so if you know of an issue that isn’t listed here, be sure to engage with us on the Forums or social media to continue the conversations. We addressed an issue where fireplaces wouldn’t remain lit. Now, they should remain lit, and if they could talk, they would probably tell their friends “come thru, it’s lit.” Because it’ll literally be lit. We addressed some cases where players were experiencing severe lag when placing wallpapers in build mode. They always say the grass is greener on the other side, but here at Maxis we try to innovate, and unfortunately we made the grass really brown in some cases, even if you don’t have Seasons installed. We’ve now returned to our regularly scheduled green grass. Spliced plants now have a proper description so you know what comprises their genetic makeup. The underside of roof eaves no longer have texture. Plants were growing a bit too wildly out and about in the world. We’ve scaled them back with some digital, organic, completely sustainable pesticide. Plants inside a planter box can now receive water again. As expected, any objects placed in the Modern Metallic Illuminated Display Case can now be moved, removed, and so forth. Calendar events will now occur on the day for which you planned them, thus ending centuries of debate on the purpose of a calendar. Player created events will now appear on the calendar as expected. NOTE: As a result of some calendar improvements, the dates for some of your currently scheduled events MAY change, but this will only happen once. In an unexpectedly diabolical twist, Sims were hosting pool parties in the winter and their guests were freezing to death. Yikes! Sims invited to the pool party are now immune to the effects of the cold during the party. We fixed an audio issue when Teen Sims plead for Forgiveness on gnomes. More important also with this patch! 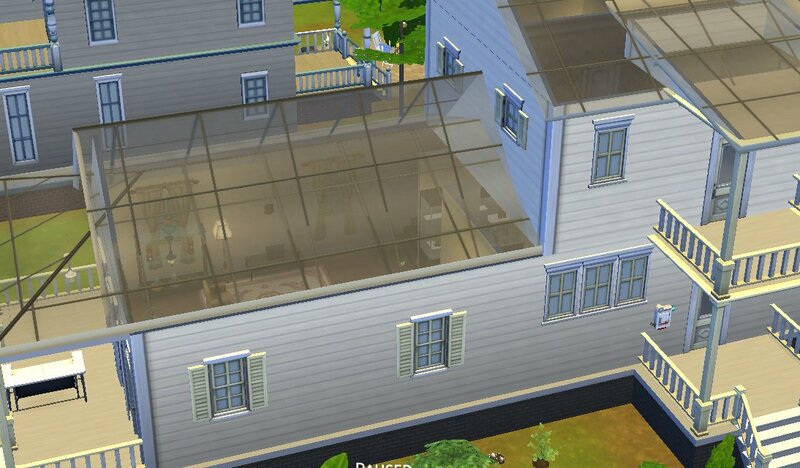 New Features for June Update (Several Tweets in Thread) – Glass Roofs! Finally! Use them to create a greenhouse or just a gorgeous new structure. You’ll find these in Build Mode. Be sure to share your creations with us on the Gallery! We added Cold Weather and Hot Weather Outfit categories in CAS. Whatever clothing you use here will work for those weather types. That means these categories will work with custom content and storytelling. We added a swimwear category for toddlers. We overhauled the Gardening Skill in a big way! We revised the tuning and balance to make it a little easier and more profitable. Less drudgery, more money! We synchronized plants to need water, etc. at the same time of day. Seed Packets can be opened if placed on the ground. 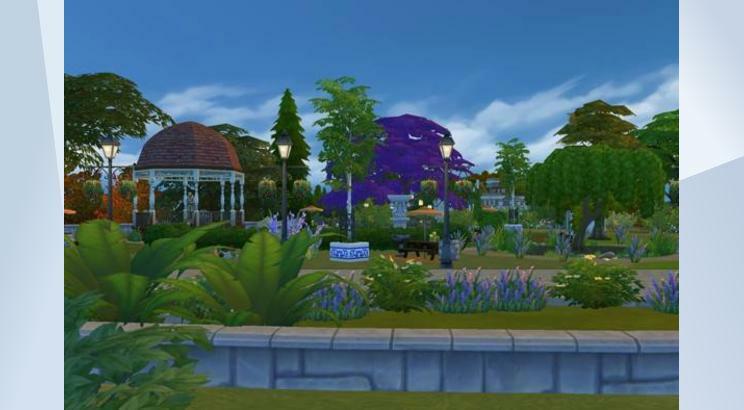 More Gardening: There is a gardening sort in outdoor activities in Build to make it easy to find all the gardening equipment. You can also buy seed packets in build now! Gardening Evolution has been streamlined to 5 levels with better UI, plus we made the interaction immediate. More Gardening: Uncommon and Rare Seed packets can be purchased once you’re at higher levels of the gardening skill. This means you can just buy them instead of hunting them down in the world. You can research plants (new interaction) to gain info for your notebook. I cant take a day off or EA is making me play catch up big time. So hear me and rejoice for we will have weather in Sims 4 starting June 22nd! SimGuruGnome is away on a top secret assignment, so writing these notes has fallen to me. I beg your forgiveness in my subpar writing style, and hope you’ll bear with me. Let’s start at the top…of your head! We made a snappy bowler hat that was previously only for female Sims now unisex. So, either gender can look silly. We did a lot of work to improve situations where a lot of Sims enter a crowded space caused Sims to stand on furniture. Sims will no longer stand atop picnic tables like film nerds recreating the famous scene from Dead Poets Society. The Tragic Clown will now always actually dress like the Tragic Clown. What was a tragedy of fashion is now just a tragedy of clownness. We’ve made MySims trophies less rare. We fixed a game freeze that occurred when trying to place stairs next to a room with half-walls. This one’s a little complicated, so stick with me. If your Sim had a baby with a Sim who didn’t live in the house, then you aged up the baby to a toddler while this Sim was visiting, they couldn’t leave. Well, now they can leave! Woohoo! Wait, Woohoo is what got us in trouble in the first place. If you set the table on the Round Selvadoradian Dining table or Dinner’s On! By Crockery Kitchen table, you can now clean the dishes. Don’t think you’re getting out of chores so easily. And other fixes and improvements. We rinsed, washed, and scrubbed many of the Laundry Moodlets causing your Sims issues, including Sims will only play positive animations for positive Moodlets and they’ll play the animations less frequently. You can now sing karaoke duets with members of your group! This will make an epic night even more epic, but be sure to read the room and not sing a downer of a song. Pastries are once again available for purchase from the Corporate Fridge Raider Revenue Generating Cooler. We’re not monsters. Finally, Jasmine is back with another boost! Give her a call on your phone to gain powerful Moodlets to help your Sims build their Culinary, Gardening, Photography, or Painting Skills. She can also help with some of your Sim’s Needs so they can get out doors for longer. 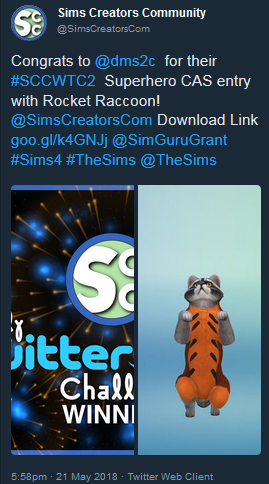 My Rocket Raccoon has won the Weekly Twitter Challenge from Sims Creators Community! Thanks to my awesome BFF Rosana from SNW I got Sims 4 Pets. So it was time I finally tried to make Rocket XD. One of the few active and amazing Sim Guru’s out there Kate has accepted the job as our new community manager!! You can read her own message on the sims 4 forum and you can leave a nice message for her too. Good luck Sim Guru Kate and may the odds forever be in your favor!